The National Law Journal’s Plaintiffs’ Hot List: The Firm has been repeatedly named to The National Law Journal’s “Plaintiffs’ Hot List’ recognizing the top plaintiffs’ firms in the country; we are the only firm in the country to be named to this prestigious list for 13 times. The Plaintiffs’ Hot List is The National Law Journal’s annual identification of the top plaintiffs’ law firms in the country, identified from readers’ nominations and through its own research. The National Law Journal: Elite Trial Lawyers: Bernstein Liebhard LLP has been named to The National Law Journal’s list of “America’s Elite Trial Lawyers” for three consecutive years (2014-2016). The firm was selected as one of the firms that “are doing the most creative and substantial work” in their respective practices and have “pulled in big victories in complex cases that have a wide impact on the law and legal business.” The National Law Journal focused on the diverse nature of the firm’s practice, emphasizing the firm’s “winning record in securities cases” and its growth in the practice areas of antitrust, mass torts, and other complex litigations. 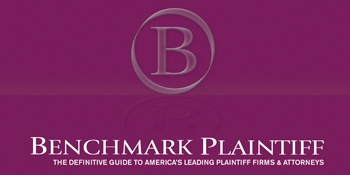 Benchmark Plaintiff: Bernstein Liebhard LLP has been listed as a recommended firm in the 2012-2015 editions of Benchmark Plaintiff: The Definitive Guide To America’s Leading Plaintiff Firms & Attorneys. Benchmark Plaintiff – compiled and published by leading financial news magazines Institutional Investor and Euromoney – identifies the leading U.S. trial attorneys and firms at the local and national levels. The rankings and editorials are the result of extensive interviews with private practice lawyers and in-house counsel. Martindale-Hubbell: The respected legal guide, Martindale-Hubbell, has given Bernstein Liebhard its highest ratings for legal ability (A) and ethical standards (V). RiskMetrics Group: The Firm was recognized in 2009 by RiskMetrics Group in its annual Securities Class Action Services list as one of the top plaintiffs’ securities class action firms in the country, as measured by annual settlement amounts, for the second consecutive year. The Firm achieved the highest average settlement amount among all plaintiffs’ law firms, averaging $254 million in settlements – a noted indicator that the Firm consistently brings and settles high-impact cases. Law360: The legal publication Law360 named the Firm to its list of the top six plaintiff-side securities firms in the nation. Bernstein Liebhard LLP made the list as a result of its “leadership work” on the $586 million settlement in In re Initial Public Offering Securities Litigation, No. 21 MC 92 (S.D.N.Y. 2009), and the $400 million recent settlement in In re Marsh & McLennan Cos., Inc. Securities Litigation, No. 04-CV-8144 (CM) (S.D.N.Y. 2009). Several partners of the Firm have been recognized for their accomplishments within their fields of practice. Lawdragon: In 2006 and 2007, Senior Partner Stanley D. Bernstein was named by Lawdragon as among the top lawyers in the country for his extraordinary professional achievements. Lawdragon uses a proprietary rating system that weighs an objective assessment of attorneys’ achievements and bar participation with journalistic reporting and online surveying of clients and peers. The Lawdragon “3000” honors fewer than 1 percent of all lawyers in America. He has also been named to several other Lawdragon lists: Lawdragon’s ” 100 Lawyers You Need To Know in Securities Litigation ” (2008), “500 Leading Plaintiffs’ Lawyers,” (2007), and “500 Leading Litigators in America” (2006). Directorship: Senior Partner Stanley D. Bernstein has been named four consecutive years (2009-2012) to the “Directorship 100,” the list of “The Most Influential People in the Boardroom” (lists that include Warren Buffett, New York Attorney General Eric T. Schneiderman, Delaware Supreme Court Chief Justice Myron T. Steele (retired), and Delaware Court of Chancery Chancellor Leo E. Strine, Jr.) as determined by The National Association of Corporate Directors and Directorship magazine. He was also featured as the cover story in the February/March 2011 issue of Directorship magazine, in which he provided the shareholder plaintiffs’ view of best board practices. Super Lawyers: The Firm’s partners have been recognized by Super Lawyers Magazine. Mr. Bernstein (2007-2009; 2012-2018), Stephanie M. Beige (2016-2018), Daniel C. Burke (2013-2017) and Michael S. Bigin (2014, 2017, 2018). Laurence J. Hasson, and Peter Harrington have been named to the Rising Stars list (2015-2018). Further, Mr. Bernstein has been repeatedly named in the Super Lawyers Business Edition (2013, 2015, 2016).